Framgången med Sword högtalarkablage väckte idén om ett signalkablage byggt på samma princip. Konstruktionsmässigt fungerar Sword-kabeln som en korrekt signalförmedlare utan de bieffekter som en traditionellt konstruerad kabel ger. Sword-serien är svårslagen oavsett prisklass. 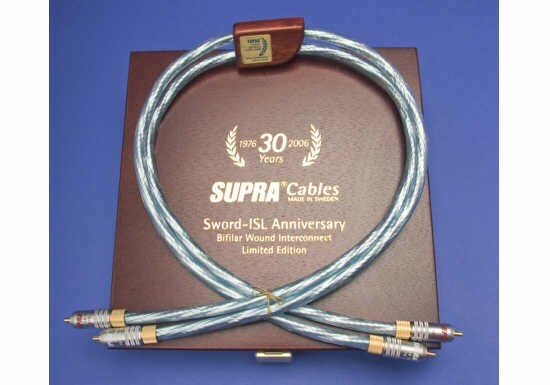 Our best analogue interconnect, Supra’s flagships. 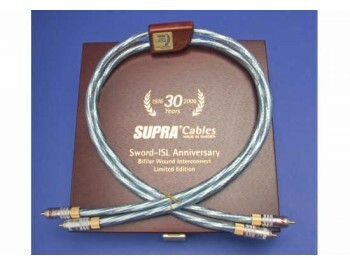 Sword–ISL is an interconnect pair with Supra RCA-8 anniversary plugs, made for analogue applications. Semi-balanced for best performance. Supra Sword passes the most complex music transients without any deformations. Signal delay is suddely the same at all musical frequencies. Therefore it vanishes, giving a clear 3-dimensional presence, a sure sign of the highest fidelity. The figure below illustrates the cable design. In each polarity there are twelve individually insulated strands forming two layers, the inner six spun with high pitch in one direction, the outer six in the opposite. This way of strand orientation, efficiently counteracts negative electrical interference giving all audible frequencies uniform transmission conditions and no open window for degrading noise to enter. The music will pass through sounding exactly the same. That is what distinguishes a really transparent cable. Phase Dislocation. 0.5-100kHz:	0.96 Deg. fråga om "Supra Sword-ISL 2xRCA till 2xRCA" är framgångsrikt Submitted.